These waters disappear in the Aneto glacier and after flowing underground for 4 km, they reappear in this wonder of nature. The Eyes of the Devel or of Jupiter is a spectacular waterfall and an exceptional phenomenon given that the glacial waters of Anet that disappear in the Forau d’Aigualluts in the valley of Benasque and reappear near the Artiga de Lin in the Val d’Aran after travelling 4 km underground. Can be reached from Es Bordes on a paved road that is closed during the winter months due to the avalanches which fall each snow season. From the protected platform with handrailing and from the high rocks of the waterfall we can take some fantastic photos of this multi-level waterfall. 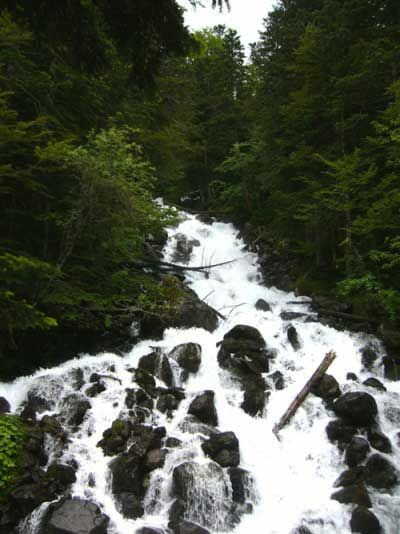 Its glacial waters and snowmelt have more or less flow depending on the season. The flow is particularly amazing during the snowmelt months of April and May. Along the access road to the Ojos del Diablo there is are parking spaces as well as a pretty picnic area with grills and tables along the Joel river banks in addition to a Restaurant. Various sections of the Joèu river are prepared and classified for catch and release fishing. A fishing map is edited each season by the Aranese government along with tickets and permission for federated and / or associates. On various points you can observe the avalanches paths from the winter coinciding with some ravines in which fall snow melt creating occasional streams and pools along the sides of the paved road.